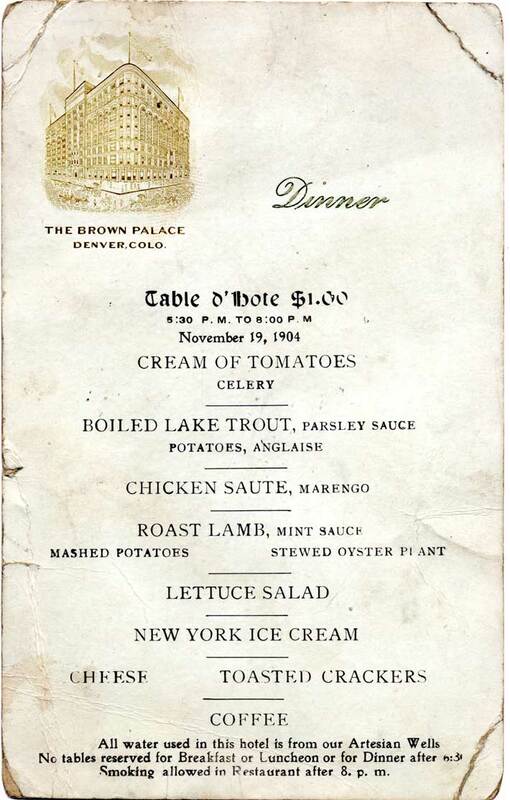 Loved reading the Brown Palace menu from 1904. When I saw the roast lamb with stewed oyster plant, I wondered how many people have ever heard of an oyster plant these days. An oyster plant is a white root with the taste of oysters. It grows to about the thickness of a finger and is best after frost in the spring of the year. The Brown Palace menu, however, was for late Novemeber. Wonder if they canned the root? Or, being a root, could have just stored it in a cellar. In a 1903 book by Jessup Whitehead, “The Steward’s handbook and guide to party catering…” there is a recipe for stewed oyster plant: scraped, boiled in water containing a little vinegar, salt, and flour to slightly whiten it; when tender, cut in short pieces in white sauce. The book also had a recipe for oyster plant fritters. Wonder why the oyster plant went out of fashion?